Join us for Community League Day 2015!! 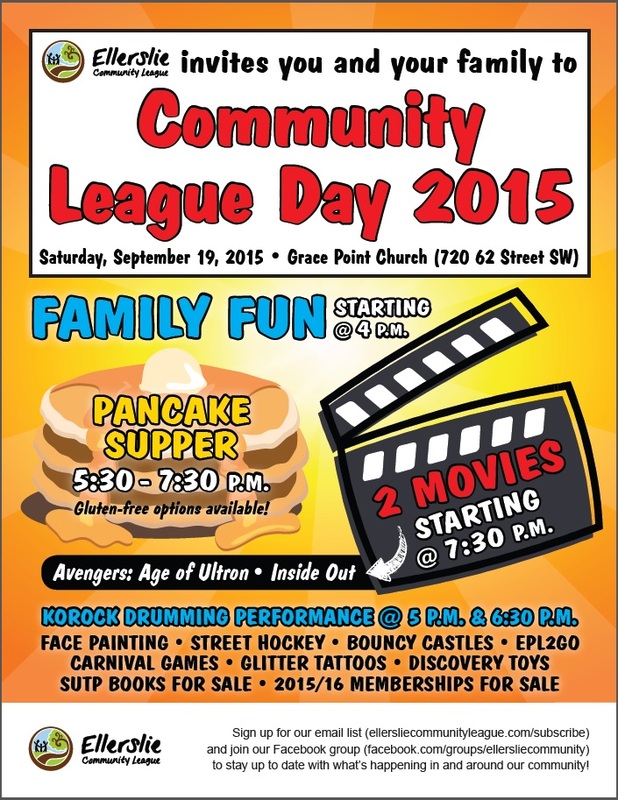 The Ellerslie Community League invites you to Community League Day 2015, held at the Grace Point Church, Sept 19th, at 4:00 PM. This is a celebration of our Community League, and it is our best event of the year! This is a FREE event with lots of family fun. Face painting, street hockey, bouncy castles, glitter tattoos, and Discovery Toys. There will be a Pancake Supper (also with Gluten free alternatives) from 5:30 – 7:30 PM. Korock Drumming will be performing at 5:00 and 6:30 PM which is a must see performance. There is also 2 TOP NOTCH movies showing, Avengers Age of Ultron and Disney’s Inside Out. We have secured pre-release copies of these great blockbuster movies from this summer! Community League memberships and SUTP Books will also be on sale.